Planning is well under way for his year’s Bingara Orange Festival which will be held on Saturday 7th July with the Bingara Orange Picking to be held on the last day of the school term on Friday 6th July. The Bingara Special Events Committee (SEC) are excited to announce new changes to the parade rules for this year’s Festival. Following many years of restrictions imposed by Council’s insurer prohibiting participants to travel on their float entry, the SEC have had a breakthrough, and in 2018 participants will be able to ride on the back of trucks and trailers as part of their entry. ‘The Special Events Committee are thrilled to have this restriction lifted, and it is hoped that this change will see a number of new entries in the parade’ said Georgia Standerwick, Marketing and Promotions Team Leader for Gwydir Shire Council. “Allowing participants to appear on their float will open up many more options for entries and make the parade so much more fun and vibrant. It is also hoped that it will encourage more groups to participate” said Georgia. The highlight of the day is always the parade, however, it is always difficult to secure participants. The SEC urges all community groups to take part and enter a float. As in past years there will be prizes for the best entry, with a total of $500 up for grabs. 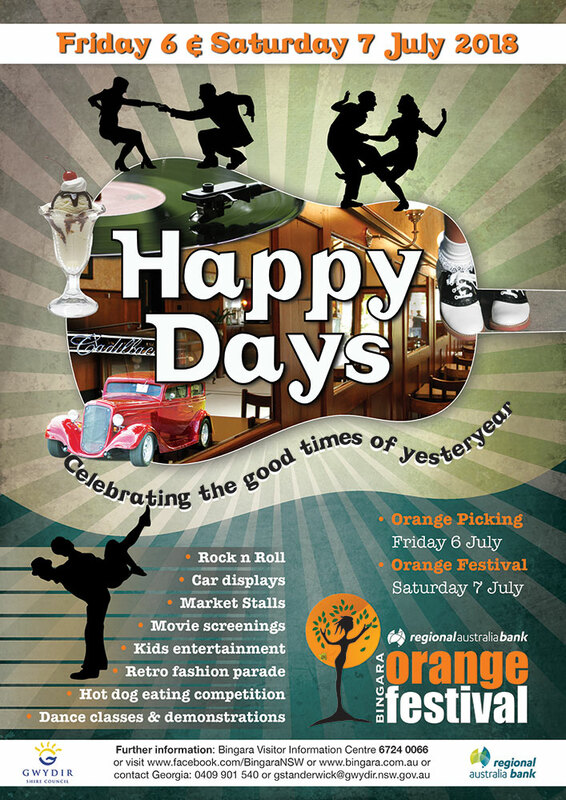 The theme for this year’s parade is the same as last year which was ‘Happy Days’ celebrating rock n roll and the nostalgia of the 50s and 60s. Groups can also theme their float to commemorate the end of World War I. In 2017 the festival took on the theme of ‘Happy Days’ which celebrated the nostalgia of yesteryear, and the Rock n Roll era of the 50’s and 60’s. This theme proved to be very successful and attracted record crowds, and extensive media coverage. Due to its success it was decided by community poll that the theme continue in 2018. “There is currently huge demand for this type of event, and the enquiries for the 2018 festival have been encouraging” said Georgia. The SEC hopes that with this theme the Orange festival will grow into a regional flagship event, like the Trundle Abba festival or Boggabri’s Drovers Campfire which have put their respective towns on the map; and generated millions of dollars for their local economies. Although the new changes to parade rules will allow participants to ride on the back of their float there are still some restrictions to this activity which are outlined in the parade entry form, and the SEC urges all participants to carefully read the complete terms and conditions before submitting an entry. For more information or to enter a float please contact the Bingara Visitor Information Centre on (02) 6724 0066.